Meet my friends and fellow runners, Christie and Carlee. I've known Christie for years, and she has walked (or should I say, run) with me through some of the hardest and happiest moments of my life, imparting wisdom all along the way. Though Carlee and I only met within the last year, our similar status as runner moms of two little girls has allowed us to strike a fast friendship. A couple of years ago, Christie single-handedly spearheaded a kids' running club in which children of all ages trained with her and then ran a 5k as the culmination of twelve weeks of practice. Since that first season, Wahoo! Running has become far more than a kids' running organization, though it is still that, too. While kids run with Christie, Carlee coaches their parents to accomplish a variety of running goals from simply getting up off of the couch to completing a first marathon or half marathon. With literally hundreds of combined races between them, Christie and Carlee have a wealth of knowledge to offer to both newbies and seasoned runners. So, they have started creating customizable training plans to share their insight with others! Because I wanted to get the full Wahoo Running experience, I decided to order my own training plan from my coaching friends. I am aiming to "crush all of my goals" (a Christie Thomas-ism) at the Prairie Fire half marathon in Wichita, Kansas, in October. I have used a couple of other training strategies in the past, but none of them were specifically tailored to my body or running goals. Wahoo goes above and beyond to do just that. Prior to constructing my plan, Wahoo sent me an Athlete Questionnaire. In addition to basic demographic information, Christie and Carlee asked me about my height, weight, previous running experience, best times, goal times, average times, how often I workout, other types of exercise I enjoy, and why I run. (That sounds like a lot of information, but I completed the whole thing in under 10 minutes.) Now, Christie and Carlee are using my answers to customize a twelve-week calendar that tells me precisely what I need to do each day. Since I'm the most Type A person you may ever meet, I need an exact schedule which includes rest and stretching as an integral part of my program. Along with my training plan, I'm expecting my Wahoo! Winning Kit to arrive on my doorstep day! 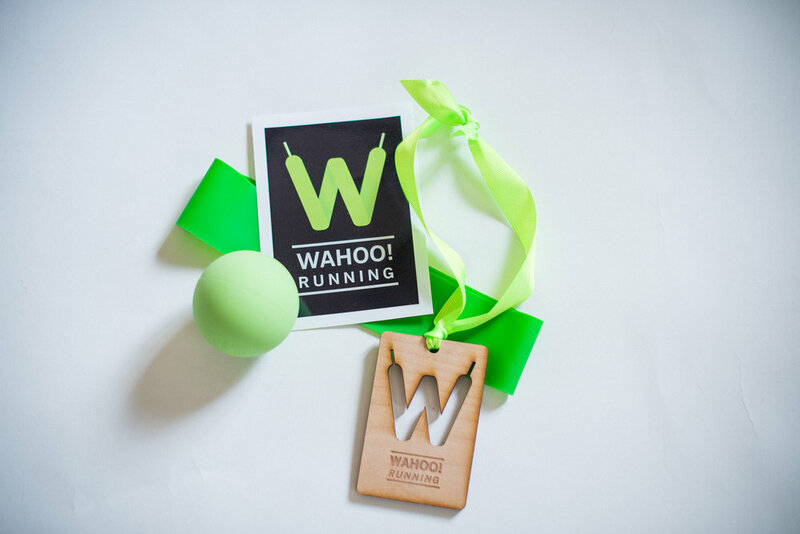 My box will include a lacrosse ball, resistance band, and other goodies to motivate me and keep my muscles healthy for race day. Dare I say that I'm pumped about running again?! I get to train with Christie and Carlee because I am fortunate enough to live locally, and we do more than run together. In our group of girls, we laugh, we cry, we laugh until we cry, we poop on the side of the road (I personally haven't done this one yet, but don't put it past me), and we run the literal and figurative hills and valleys of life together. If you don't have a running community where you live, I know that the faces behind Wahoo would encourage you to start one. I'm a big fan of winning, but that isn't why I run. Christie and Carlee get this. In a matter of months since they have launched their business, these coaches have guided multiple runners to set new PRs and win age categories in the races they enter. However, Christie and Carlee's main goals are for runners to stay healthy and to have fun. Their desire is for people to "experience running the way it's meant to be." In other words, they want runners to never outrun their love of running. If you've lost your purpose for running or are looking to find a purpose for the first time, Christie and Carlee can create the perfect plan to get you on track within a week. After that, they will follow up with you to see how things are going, not because they're trying to build a business but because they genuinely care about you as a runner and as a whole person. Check out Wahoo! Running on their website, Instagram, or Facebook page. You can also email the coaches directly at christie@wahoorunning.com or carlee@wahoorunning.com. Photo credits: Christie Thomas and Teena Moore Photography.